You certainly never know what movie he'll review next! Ring, ring! Hi, it’s Burl calling! Ha ha, did I scare you? 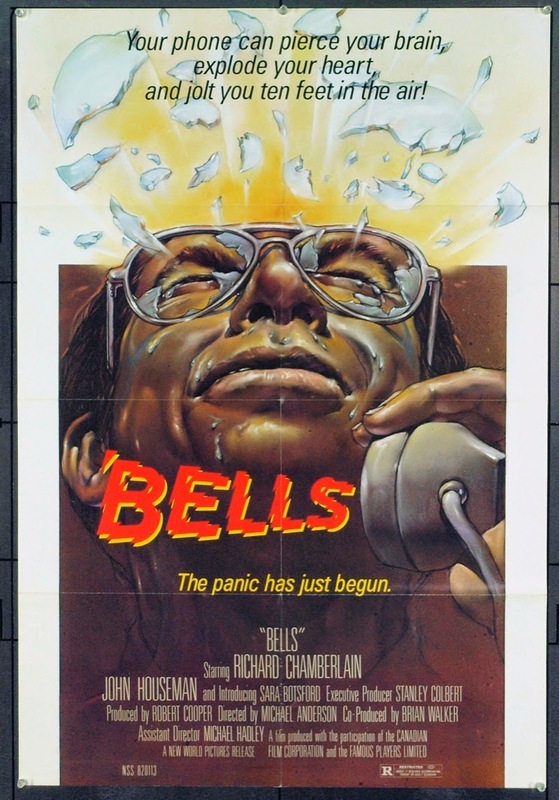 Today I’m going to talk about the movie Bells, in which all telephone calls take on an aura of menace! If you ever missed the hearty ring of an old telephone, this is the movie for you! The sound effects department certainly didn’t skimp on that particular noise! Bells is better known under its video title Murder By Phone, but that version is truncated by a full fifteen minutes! For the full effect you have to watch Bells, my friend! You’ll meet a dedicated environmentalist science professor played by Richard Chamberlain, whose prize student gets zapped by a subway platform payphone one night! How? Why? That’s the mystery! Chamberlain travels to Toronto to figure it out, and hooks up with his old mentor John Houseman, whom we know from The Fog and Ghost Story, and who taught him everything he ever learned about environmental activism! But in a startling coincidence, Houseman is now working for the phone company as an environmental consultant, “behind the fence,” as he puts it! And the phone company knows something about the phone-zapping incident! Meanwhile there are further zappings, all of them a great pleasure to watch! One lady gets zapped and her Mickey Mouse phone is spattered in blood! Another fellow catches the zap while seated in his office chair, and he flies out the window and down ten stories and onto the top of a car, lounging in his chair all the while! Another lady is doing the dishes and the whole sink explodes as she flies back across the room! So what’s the story on all this zapping? Since Chamberlain is an activist who’s hit the barricades many times in his struggle for environmental justice, and is naturally (and justifiably) suspicious of big businesses, I thought the answer would involve a corporate conspiracy, but it only does in the most minimal way! It’s kind of disappointing actually, to find that a lone maniac is behind it all, killing for mostly fairly petty reasons! The initial killing that sets off Chamberlain’s investigation was merely a test, it seems, and the fact that the victim was a student of a man whose friend is closely connected with the deadly events is a remarkable coincidence never remarked upon in the picture! Ha ha! I like the world presented by this movie, in which there’s a great history of what used to be called ecological activism and a codified system of protest in which long-time players achieve infamy in corporate circles! Also, this movie seems to assume that of all corporate practices, those of the phone companies are the most fiendishly destructive! 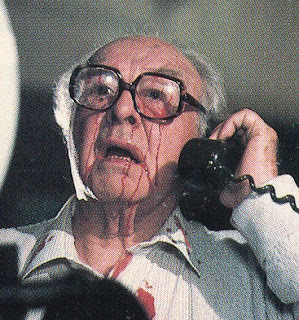 I also was glad to see Houseman in this picture, even though he gets a glasses-shattering zap scene of his own! And frankly there are some pretty effective suspense sequences, in which the heroine, a muralist played by Sara Botsford, is tele-stalked by the nebbishy maniac! The zap scenes are pretty good, as I mentioned, but I thought they could have sprung for at least one exploding head! That would have been totally appropriate! But we get some exploding eyeballs and a semi-crushed head, so it could have been a lot worse! I kind of like the drab look of the movie; and the chattiness of the script, especially in the full 94 minute version, is perfect for a movie about talking on the phone! Bells is a massively, goofily, cheerfully silly picture, there’s no doubt about it, but I still thought it was a pretty good time at the movies! I’m going to give it two and a half ominous shots of Royal Bank Plaza, which is actually a lot fewer than the movie gives itself! Hi, I'm Burl and I like to review movies! I'm going to see if I can review them all eventually!